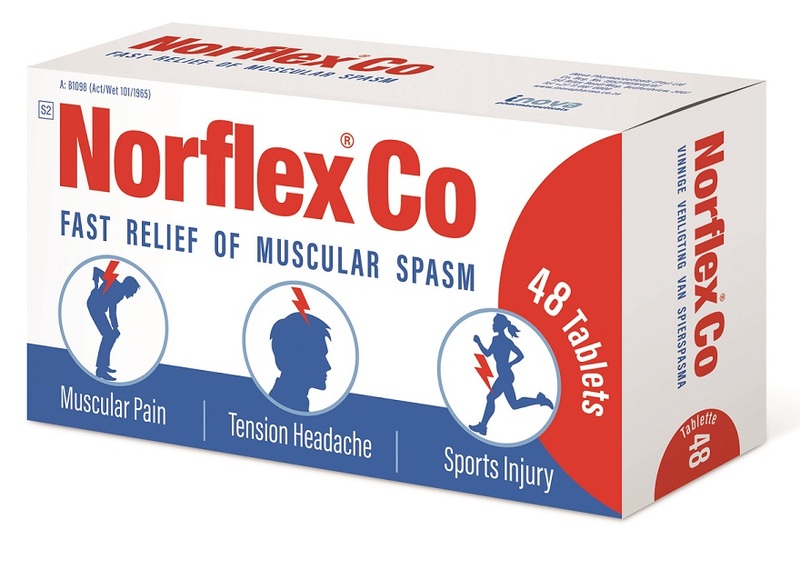 Muscle strain or spasm caused by injury, sport or work related accidents can be effectively relieved2 using South Africa’s most prescribed muscle relaxant brand, Norflex®1. The range includes Norflex®, which contains 100 mg Orphenadrine citrate and Norflex® Co which contains 35 mg Orphenadrine citrate along with 450 mg Paracetamol. New to the range is Norflex® Gel, the first-to-market Benzydamine Hydrochloride topical gel in South Africa which is indicated for symptomatic relief of painful inflammatory conditions of the musculoskeletal system 2,3,4. There are numerous painful conditions associated with muscle spasm, most frequently these are musculoskeletal disorders such as muscle strain and central nervous system disorders associated with spasticity5. Studies have shown that centrally acting skeletal muscle relaxants2 such as Norflex® are effective, have tolerable side effects, and can assist in the treatment of painful musculoskeletal conditions with associated muscle spasm5. Orphenadrine citrate (Norflex®) has an onset of action of one hour2 and can be used in combination with simple analgesics 5, 6. Norflex® Co, which patients can take 3-4 times daily, gets to work on the strain or spasm quickly, within 30 minutes7. In studies done to assess the efficacy of using Orphenadrine citrate together with Paracetamol, it was found that pain, stiffness and functional impairment significantly improved with combined use. The analgesic or Paracetamol limits distress due to pain and the spasmodic or Orphenadrine citrate facilitates early mobility by overcoming excessive muscle spasm6. In terms of controlling the vicious cycle of muscular spasm, Orphenadrine citrate works centrally and interferes with reflex pathways for pain and skeletal muscle contraction 7, 8. Furthermore, the Paracetamol in Norflex® Co acts centrally and peripherally2 and provides effective pain control 5, 6. McGuinness BW. A Double-Blind Comparison in General Practice of a Combination Tablet Containing Orphenadrine Citrate and Paracetamol (‘Norgesic’) with Paracetamol Alone. J Int Med Res 1983;11(1):42-45. Hunskaar S, Donnell D. Clinical and Pharmacological Review of the Efficacy of Orphenadrine and Its Combination with Paracetamol in Painful Conditions. J Int Med Res 1991;19:71-87.